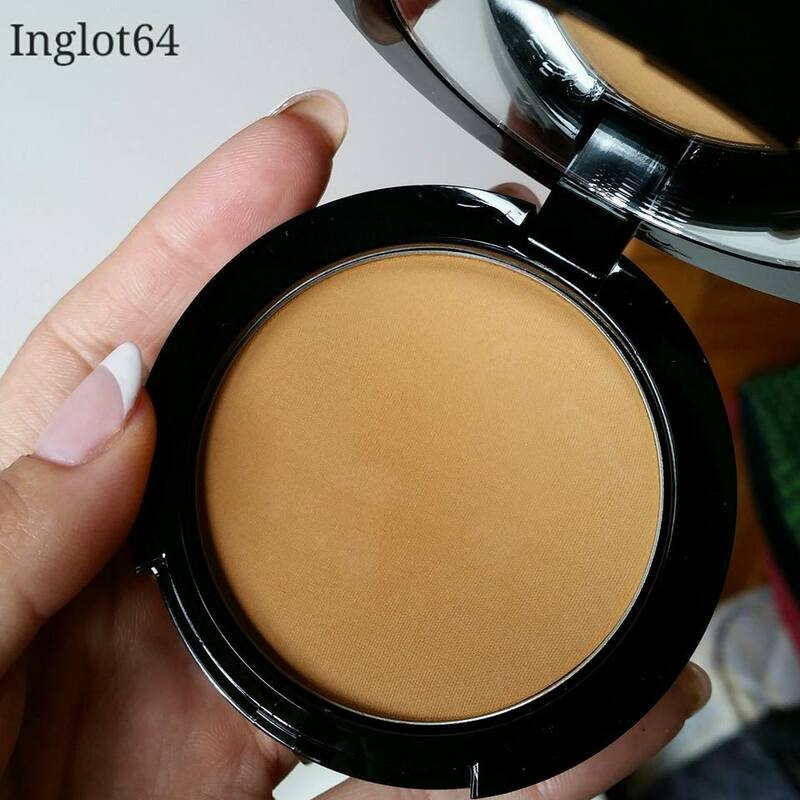 MakeupMadness107ByElina: How 2 bronzers became 1. How 2 bronzers became 1. My birthday was in August so I got a lot of makeup to try out including these 2. Bobbi Brown bronzer in Medium 2 and Inglot n 64. 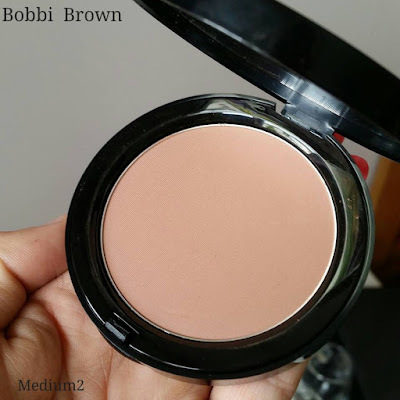 As most of you know the lighting in shops can be very deceiving and you may walk out with product that actually looks completely different and this was the case for these 2 so I tried using then few times and hated the colors and left them behind for the longest time until last month I decided to try The Bobbi brown bronzer but I didn't like it again and need something warmer on top and used the inglot one and now I love using both of them together as a Contor/bronzer duo. The reason why did not like these colors that it was slightly pinky and I prefer more bronzers that contour shades since I have a lot of yellow in my skin the cantour shades tend to look really muddy and not flattering at all on me. 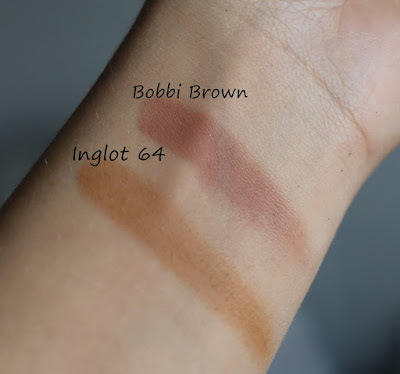 This one on the other hand is straight up orange, when I went to inglot to ask for bronzer the sales assistant immediately showed me this one I looked at it and it seemed fine so I got it, but when I got home and tried it on there was non way even I could pull this of, since inglot products are really pigmented even using little bit looked like just orange stripes. 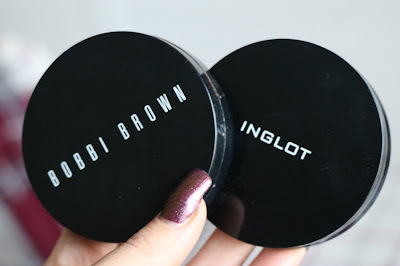 As you can see they are 2 completely different colors but they go together so well and look flawless on skin I apply the Bobbi brown one first more like contour then go over with bigger brush and the Inglot 64 powder and it just is the perfect combination. If you are really fair dont try these as they will be way too dark and orange for you , I have medium skin tone so they suit me. MORAL OF THE STORY: Even tho you don't like something try mixing products you may end up with a life changing combination of something you can't part with instead of 2 makeup products that you hate and wasted money on. P.S. For those who did not know I usually take my pictures when the makeup in brand new so that when I do posts it wouldn't look all dirty and used up, sometimes I may not but most of the time I try to do when the makeup hasn't been touched, just to let you know cuz I have had people ask me how do I even know if the product is good if I haven't used it cuz it looks new. Anastasia Beverly Hills Vs Inglot Contor kit.